Tired of watching the picture on her television freeze and pixilate, Mary Beth Trama finally gave up. After five visits from a Comcast repairman who failed to solve the problem, Ms. Trama, an information technology specialist in Claremont, Calif., dropped her cable service and signed up for satellite television from DirecTV. Part I, the October issue of the Technical Bulletins addressed digital cliff problems associated with the improper selection of antenna-sites, tower heights and antenna-arrays. The December issue of the Technical Bulletin goes one step further, discussing the sudden loss of HDTV pictures in operational CATV systems due to the digital cliff phenomenon. 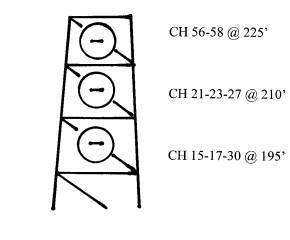 Head-end engineers are glad to notice the co-location of analog TV stations and their digital affiliates, as well as the fact that many Metropolitan Area TV stations share the same tower or antenna farm, such is the case in New York, Los Angeles, Chicago, Philadelphia, etc. With the aid of a large diameter parabolic antenna the reception of four to six TV stations can be conveniently secured, reducing the windload on the tower. This concept works very well for CATV systems in the Grade “A” contours of the stations, at a distance of 35 miles or less. Conditions can be dramatically different when the receive site is in the fringe area of the Radio Horizon Range, the terrain is less than perfectly flat, or when inclement weather conditions reduce the received UHF signal levels. Under those conditions, after splitting the received DTV signal four or six-ways, the minimum signal level requirement may not be achieved. 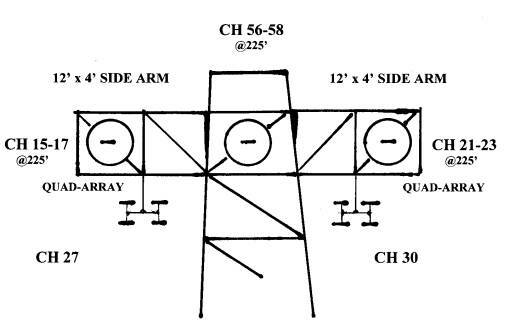 Discussed here is the case of a 230 ft high self-supporting tower ( the top portion shown below) supporting three large diameter parabolic antennas, to receive a total of eight UHF analog and DTV stations from a major Metropolitan Area. The parabolic antennas were installed with a reasonable vertical separation, thus the lowest antenna ended up at a reduced height of 195 ft above ground. Under inclement weather conditions the DTV reception became unreliable. Move all antennas to the top of the tower, at 225’ above ground. Designate the parabolics for the reception of two adjacent channels. Use quad-arrays of single channel Yagis for the reception of Channel 27 and Channel 30. Install antenna-mounted single channel, low noise preamplifiers. The limited antenna height improvement, considering UHF reception, may result in a 1 dB or less improvement in the Carrier/Noise ratio. However, in Digital TV reception every dB counts! Splitting the received DTV signal two-way, instead of a 3-way, will also increase the signal level at the HDTV receiver. But the biggest Carrier/Noise ratio improvement will come from the application of the single channel, low-noise preamplifiers. Preamplifiers with 3 dB Noise Figure are standard items. Some tweaking can reduce the Noise Figure to 2 dB. Compare the 3 dB NF of the preamplifier with the 8 to 10 dB NF of the DTV receiver. The improvement is in the 5 to 7 dB range. Furthermore the antenna mounted preamplifier will eliminate the 4 dB insertion loss of the antenna downlead. A total improvement greater than 10 dB was thus achieved. Conclusion: The new Carrier/Noise Ratio, established at the input of the first active device, the low-noise preamplifier, will be 10 to 12 dB higher than before. This 10 to 12 dB reserve gain may protect the reception from digital cliff effects. Note: Single channel preamplifiers require a little retuning. They have to cover the adjacent channels without a significant reduction in gain. UHF preamplifiers have a tendency to cover more than one channel, thus the retuning of the device is practical and feasible. The photograph above shows the sweep testing of a preamplifier retuned to cover three adjacent channels with 23 dB gain and a ±1 dB frequency response. Multipath can have a devastating affect on the HDTV picture quality. In metropolitan areas tall buildings cause reflections, while in rural areas hillsides and mountain tops are the usual culprits. Neither computer programs, nor theoretical studies can predict the intensity of multipath conditions. Reflectivity of the surface can change dramatically and obstacles may affect the desired and undesired signals. Only on-site testing can properly measure the affects of these impediments. 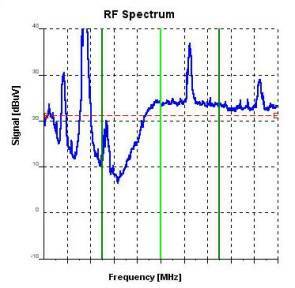 Multipath effects can be recorded and analyzed from the screen of the spectrum analyzer, as demonstrated below. Compare the two power spectrums. 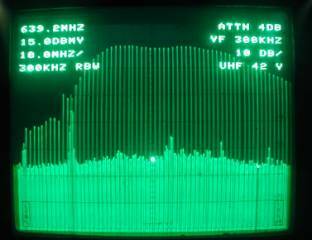 The flat, 5.5 MHz wide power spectrum on the left is the representation of an ideal, reflection-free over-the-air DTV reception. The power spectrum on the right has a deep notch and a high peak, caused by reflections and wave propagation anomalies. To protect the DTV reception against multipath reflection in the horizontal plane, apply an antenna or antenna-array with higher directivity in the horizontal plane. If your system is using Model PR-TV, cut-parabolic antennas, there is an excellent chance for ghost reduction by changing to true parabolic antennas. 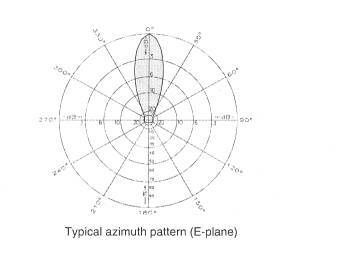 Observe the horizontal plane radiation pattern of the cut parabolics, in a figure supplied by the manufacturer. It is a complete fabrication. This pattern was created on the drawing board. Cut parabolics have no compression in the horizontal plane; The radiation pattern is similar to that one of a dipole. Compare it with the radiation pattern of a quad of 12 element single channel Yagis shown on the right. The radiation pattern is less than perfect (side-lobes), but the main lobe is definitely narrow. 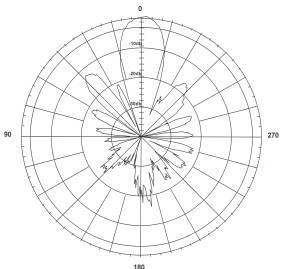 This radiation pattern was taken at the company’s antenna test-range, not created on the drawing board. It has been stated before that the pixelation or total loss of HDTV video and sound occurs suddenly, without warning. This is true, but not 100% correct.. 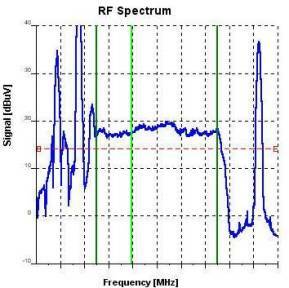 There is a method to predict when DTV reception is approaching the critical threshold level. An expert application of the Bit Error Rate (BER) tester is the answer. By definition Bit Error Rate is the ratio of the number of incorrectly received bits compared to the total number of bits, sent during a specified time of interval. The error ratio is usually expressed in scientific notations. For example 2.5 erroneous bits out of a total of 100,000 transmitted would be 2.5 x 10-5 . A 10-9 rate means practically error free transmission. Bit error rate testers come in many sizes, shapes and formats. A very popular meter is shown below. 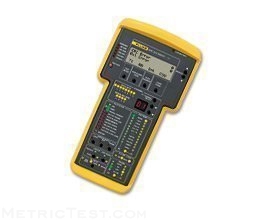 The FLUKE Model 635 QuickBERT-T1 is a reasonably priced, hand held, compact instrument, providing instantaneous digital readout of transmission errors. Although Bit Error Rate should not interfere with your social life, make BER testing an integral part of your weekly head-end maintenance procedure. While during the construction phase workers can make mistakes, the discussed issues of mutitasking and multipath conditions are related to planning and site selection. Mistakes and project delays can be prevented by a timely conducted technical review. Is a “second opinion” expensive? Yes, but good advice may save money at the end.